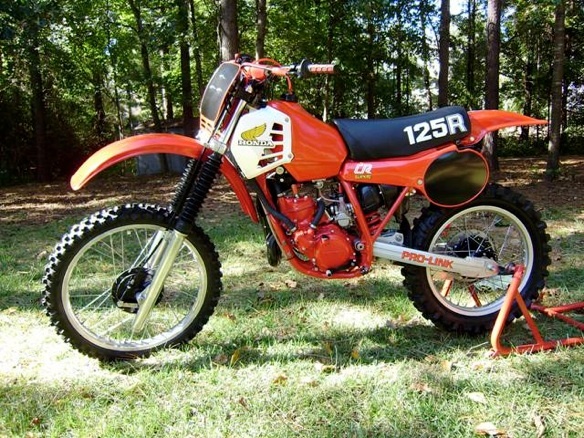 This is my just finished restoration of a 1981 CR125R Elsinore. I found it on eBay in Phoenix about three years ago and have been working on the restoration over the past two years. The bike was completely disassembled and all parts were bagged and tagged, paint applied, etc. Much time was spent spent hand polishing every piece of hardware, and much of it was replaced. The engine was completely disassembled and re-built as well as the suspension front and rear. All of the plastic is original and many new parts that could not be found such as the cooling system hoses were sourced with help from a kind counterman at an auto parts store who allowed me to rummage through there preformed heater hose stock. After much searching I was able to duplicate the stock bends and trimmed to fit. I found a race kit oval slide carb new in the box on eBay, as well as wheel bearings, cables, decals and so on. I built it to be a genuinely race ready bike, not simply a static display right down to 3M clear adhesive on the frame and engine areas wear your boots would chaff the paint. It is not a museum grade restoration but it turned out very good. I am still searching for the original type front number plate as the one on the bike is a period Acerbis part. I like the significance of the 1981 model year as it was so important for Honda and the facts that it was the last year of the Tahitian red frame and engine, first year Pro-Link rear suspension, first year liquid cooling, and most import it was the last year they were badged as Elsinores. It has about 5 heat cycles on the engine so far with one first and second gear full on... It absolutely rips. Now I need to get over the fact that it will get dirty ... Enjoy!